The constant region encompasses the entire Fc region, as well as one domain of both the heavy and light chains in the two Fab regions (see figure 16.4). The amino acid sequence of this region is the same for all antibody molecules of a given class and it imparts the distinct functional properties of the class. The consistent nature of this amino acid sequence allows other components of the immune system to recognize the otherwise diverse antibody molecules. 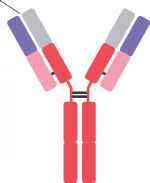 Figure 16.4 Basic Structure of an Antibody Molecule (a)The Y-shaped molecule; the arms of the Y make up the Fab region, and the stem is the Fc region. (b)The molecule is made up of two identical heavy chains and two identical light chains. Disulfide bonds join the two chains as well as the two halves of the molecule.The constant region is made up of the domains depicted in shades of red.The variable regions differ among antibody molecules, and account for the antigen-binding specificity of antibody molecules.